Many known sound localization algorithms are based on processing signals received by multiple, spatially separated sensors, e.g. microphone arrays. The advantages of single-channel sound source estimation are the lower costs for a single microphone and the possibility of developing very small gadgets. In this work we developed an accurate speaker localization strategy in the horizontal plane using the signal of only one microphone. Based on a set of measured head-related transfer functions (HRTFs) from a dummy head and a statistical model of speech, an estimation of the sound direction has been carried out. 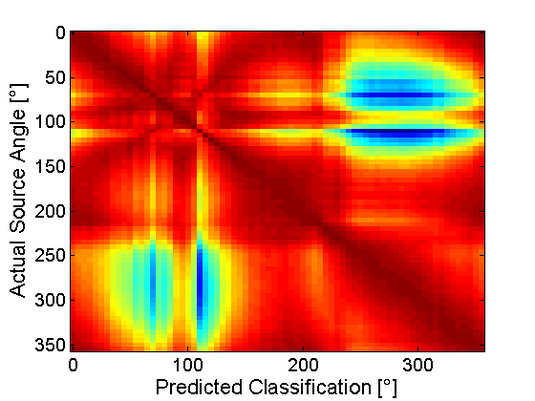 High-dimensional spectral features (STFT coeﬃcients) are taken and the direction of the sound source is evaluated with Gaussian mixture models (GMMs) using a maximum likelihood (ML) framework. An evaluation of the developed method in a synthetic test environment yields excellent results and leads to a promising approach which can be further investigated in future research.